Your garden should be an amazing place where you allow your imagination to consume you and take over. It can be an intricate part of your home’s identity and part of what sets your house apart from the neighbors. Plants and flowers shouldn’t be the only characteristics of your garden. You should use every inch of available space in order to keep your landscaping as an extension of your creative mind. 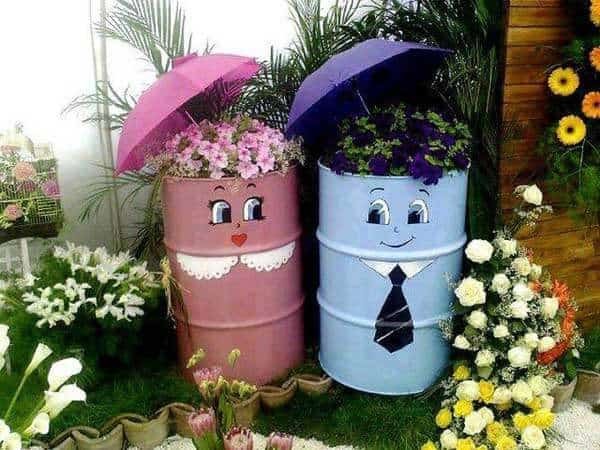 Instead of using containers and pots for simply holding flowers, turn them into their own individual works of art. 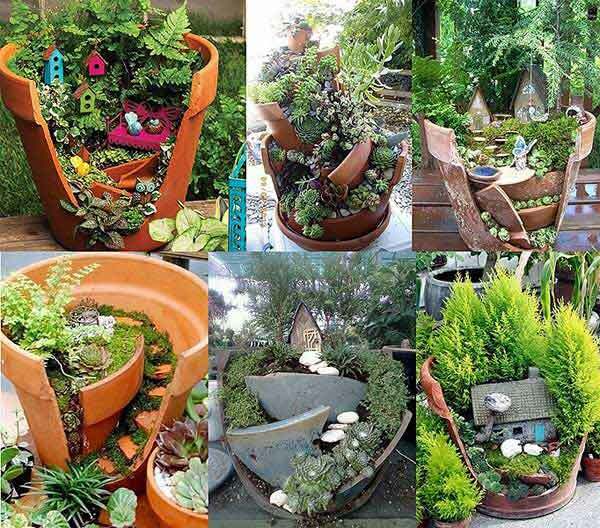 Simply replacing any bland or boring pots with something featuring more color and personality will spice up the atmosphere of your garden. Beat up and broken items can be brought back to life by putting them to use in a flower or plant arrangement. Cabinets, old tires, boots, wine barrels, and a wide variety of other things that may appear to be useless will have new purpose and meaning. The following photos can help spark your imagination. 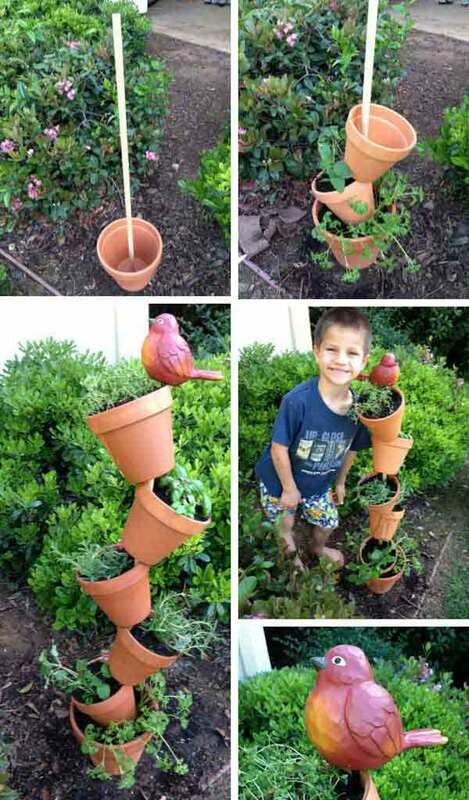 Once the kids start to outgrow old toys, they will make creative flower pots or containers that are lightweight and easy to move around. You can create a theme throughout your landscape or even just let them stand out on their own. Cracked and even broken pots combine to create a unique masterpiece that will be sure to catch anyone’s eye. If you are forced to work with a limited space, take advantage of discarded wooden pallets or sheets of plywood. 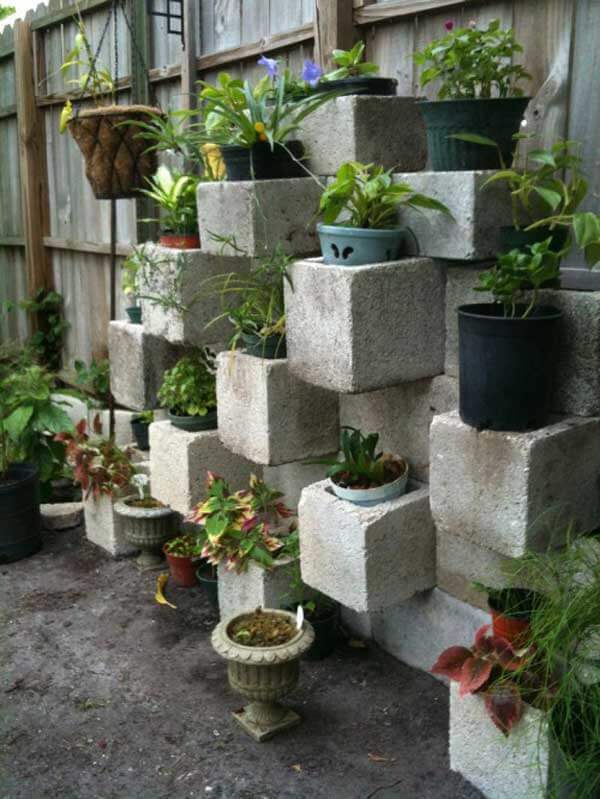 These are perfect for creating a vertical garden. Finally tired of that dead log that has been lying around for weeks or even months? 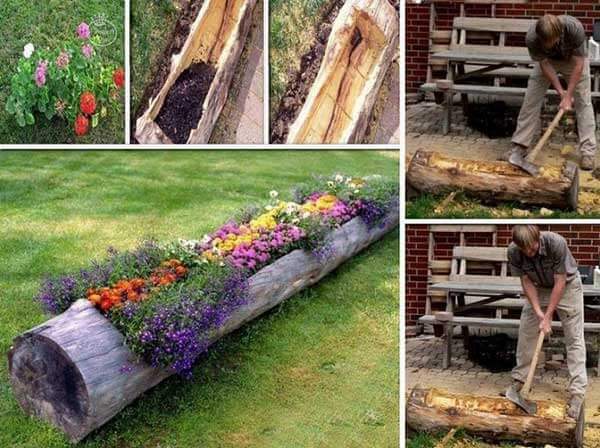 Try hollowing it out in order to create an all-natural flower bed. Our favorite gardening pro Tom Bartels is teaching free courses on composting but they're filling up fast, so sign up now! Stakes are very effective when you are tight on space. 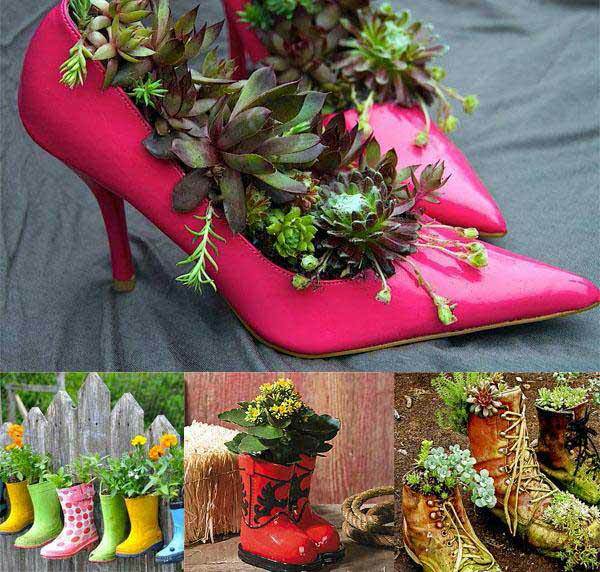 They are perfect for creating a standing flower garden. We all have our own opinion on cement blocks. Spares are no longer used just for stepping stones and short retainers. Try finding unique ways to put extras to use in order to save on your budget and add character to your scene. 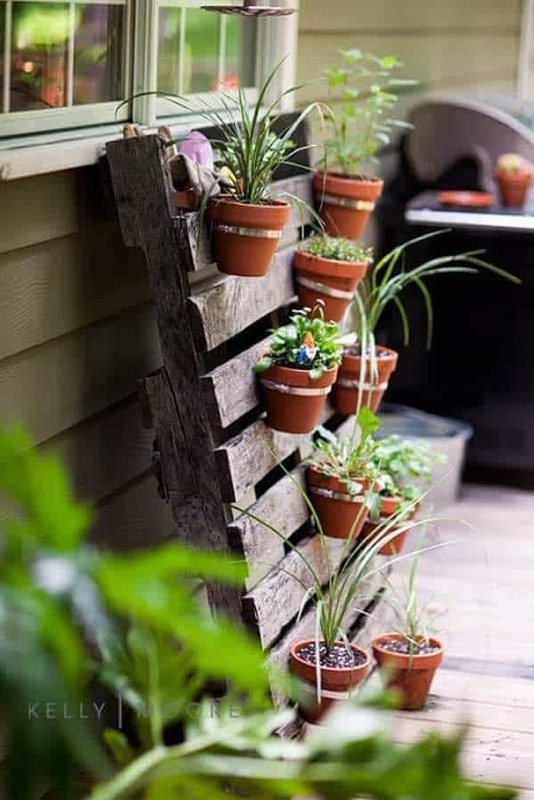 Disassemble and reuse old wooden pallets in order to create a plant or flower arrangement that will give a rustic and older look to your garden. 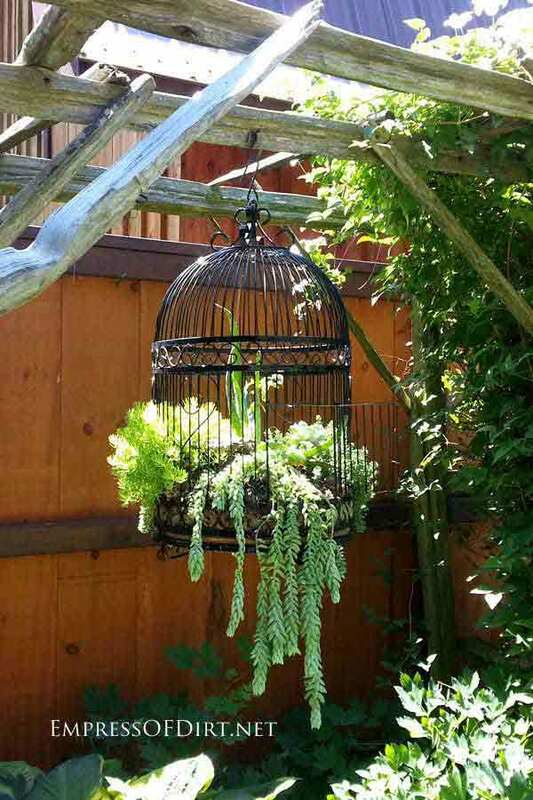 Hanging wire baskets and even unused bird cages make an excellent way to create a suspended or elevated flower arrangement. Even an old bicycle frame can help to design your own individual style and flare. 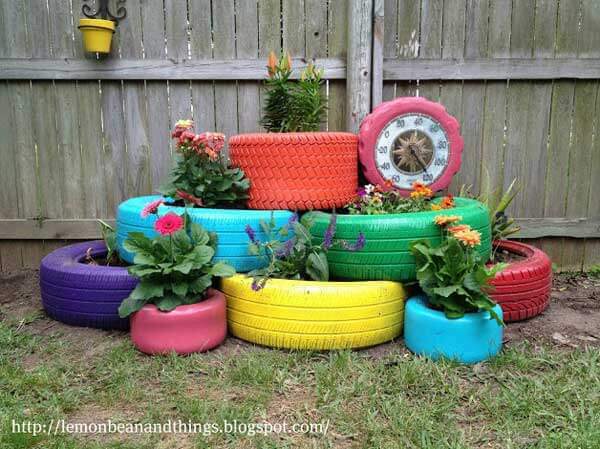 They create several possibilities for adding color to your garden. How creative can your mind be? 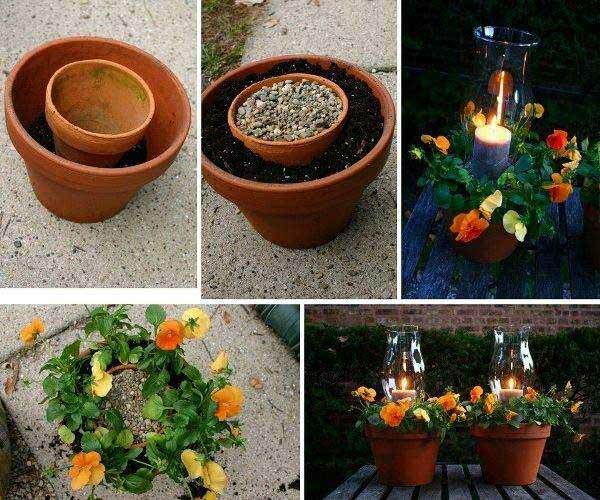 Try using ordinary clay pots in a variety of sizes to build flower arrangements that are not available at the local nursery or gardening center. 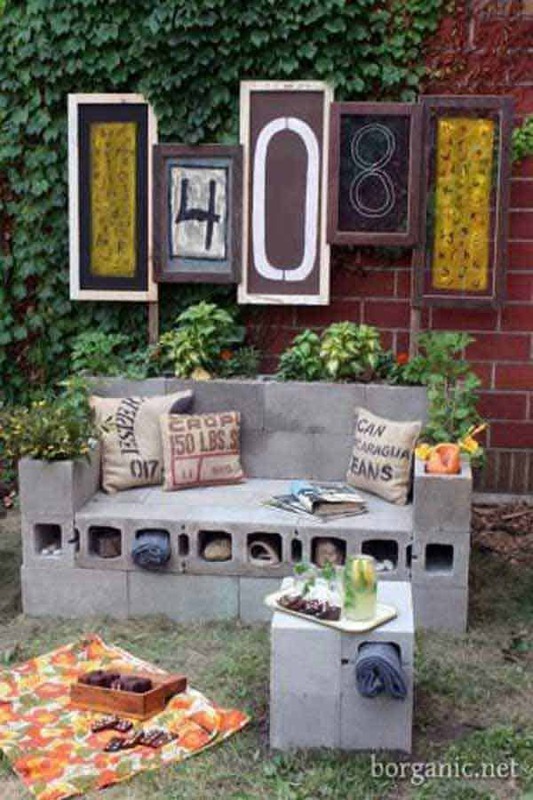 These cement blocks were used to add color and art to an ordinary section of fence. By going vertical, additional room has also been made to add to the scene. Are you well known for your shoe collection? 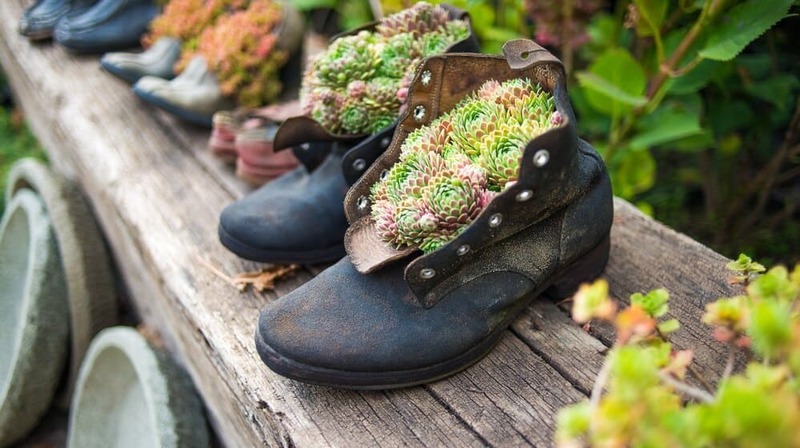 Add part of your identity to your landscape by using older shoes as colorful containers for flowers and plants. 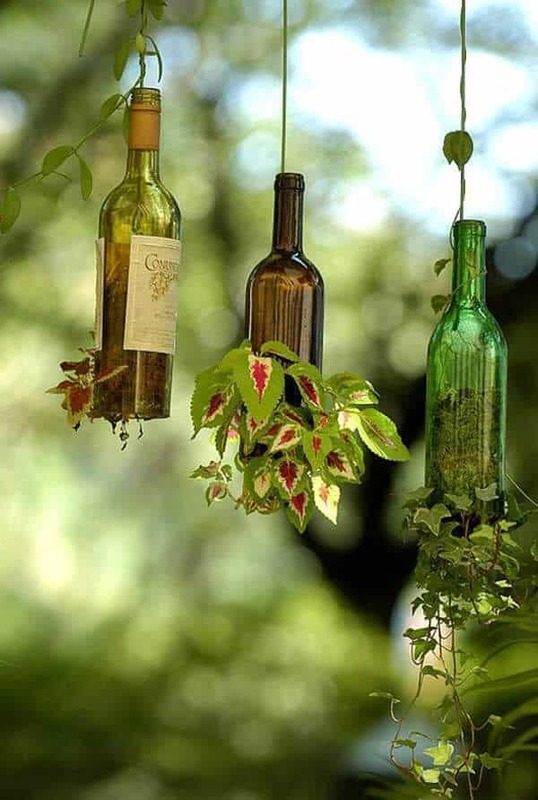 Empty glass wine bottles are another great way to have a decorative hanging piece. They are lightweight and easy to move from place to place throughout your landscape. With a touch of creativity, nothing is out of the ordinary. 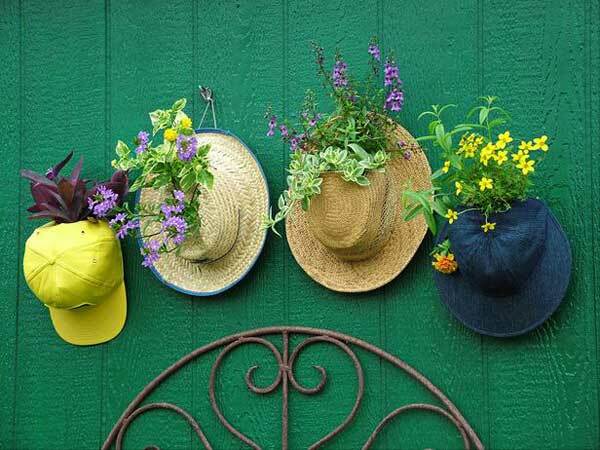 This hat collection was used to add color and flavor to hanging flower arrangements. Outdoors would not be the same without a wild animal or two. 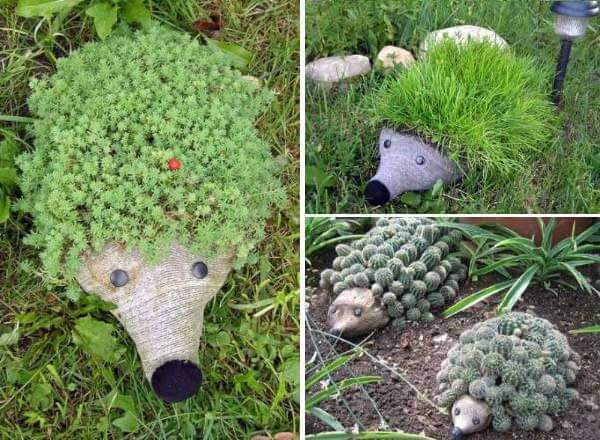 These little guys blend into the scene perfectly to add personality to the garden. 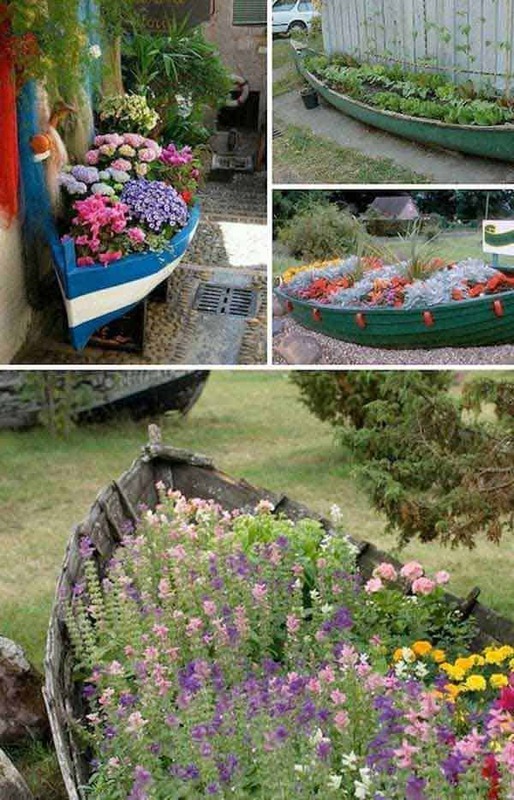 An old canoe or rowboat that is no longer usable repurposes wonderfully as a flower bed, adding to the theme and design of your landscaping. 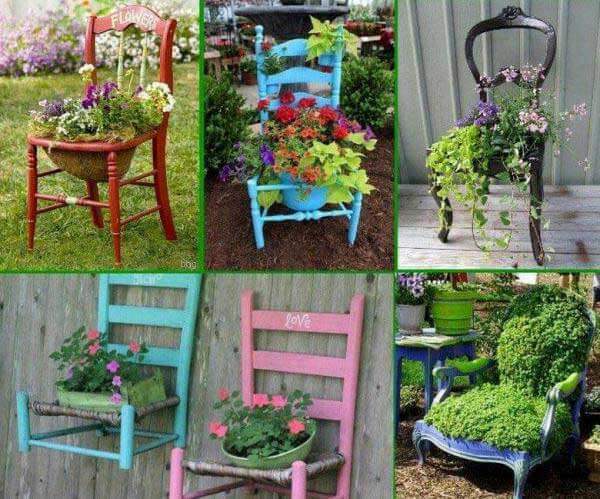 Broken furniture such as an old wooden chair also stands out as a decorative piece to make any flower or plant arrangement a little less ordinary. If you enjoy seed planting and seeing your flower or plant’s life unfold from day one, a wine cork can be turned into a perfect pot for the seed to germinate in. 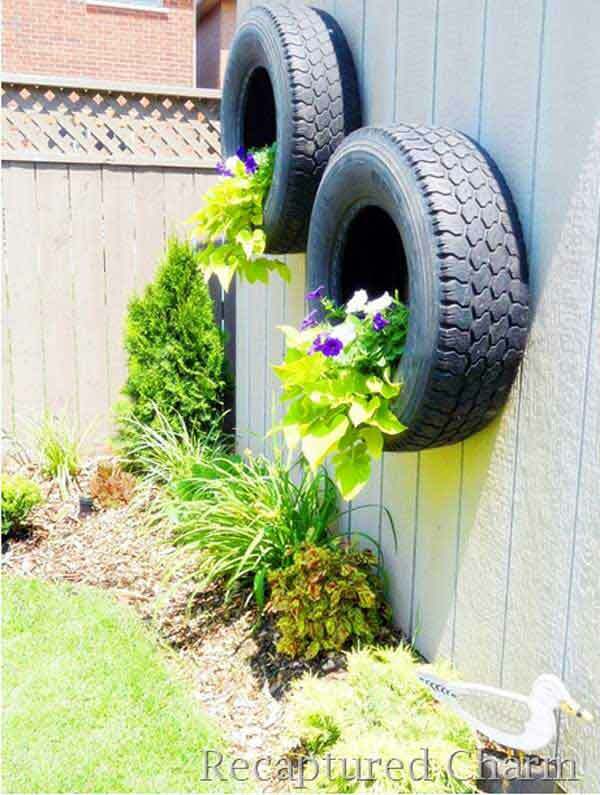 Used and discarded tires make a great centerpiece for a hanging arrangement. This will elevate parts of your garden and provide you with extra space on the ground if you are working with a smaller area. Stacked tires are used here to create a vertical piece. A simple coat of paint will and color and variety, and give a fresh look to help your flower garden stand out. 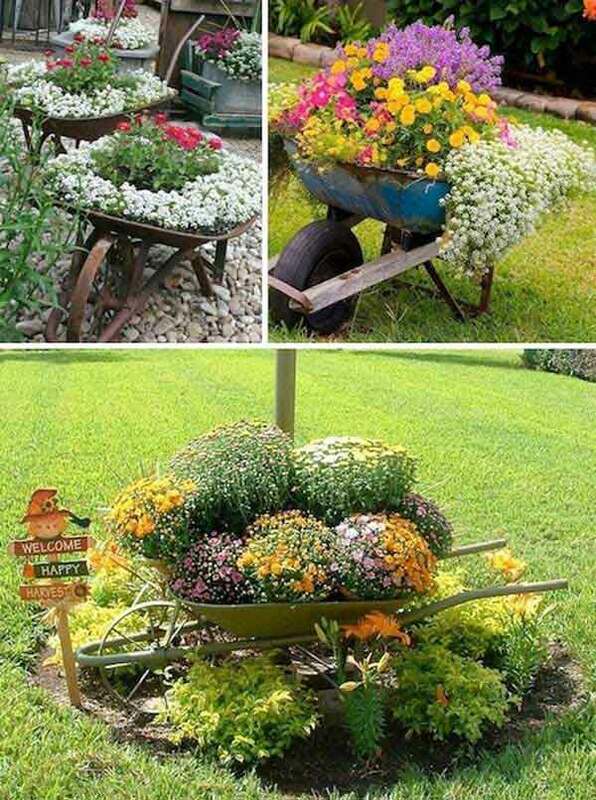 Every gardener has that old wheelbarrow they will not get rid of. 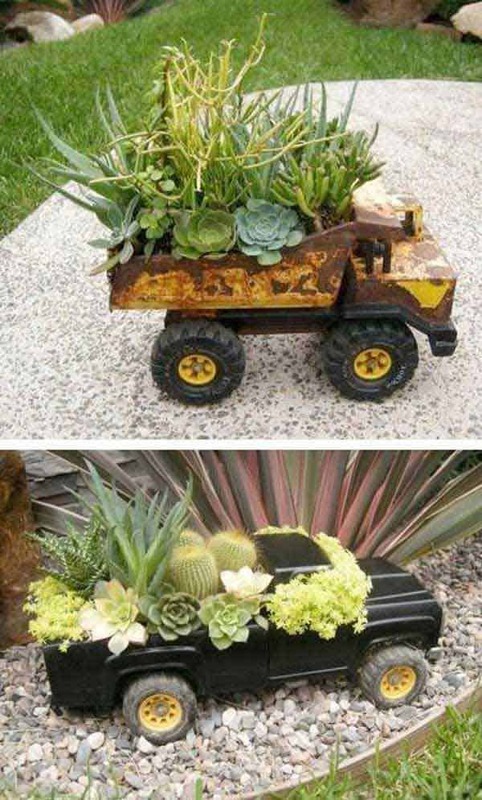 Repurpose these to make a great garden on wheels that is raised off the ground and easy to move from place to place. Even if they need to be bought brand new, a fabric shoe rack will increase your space and can be used to add color to any fence panel or bare wall in your garden area. They usually cost no more than $5-10 at any department store, making them a great value. 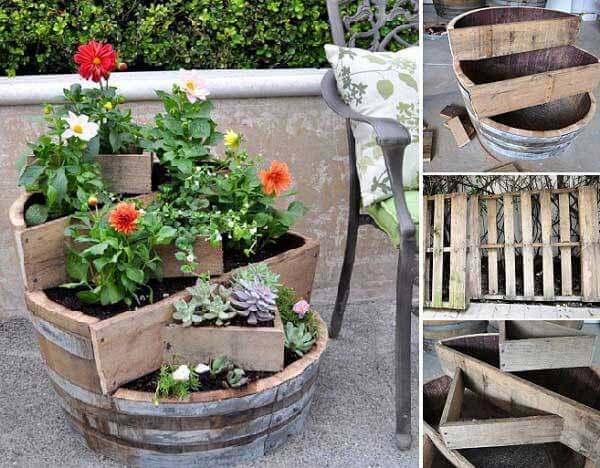 With a simple coat of paint, an old barrel will go along with any theme. Although they do not provide a method of stacking plants and flowers, this is a creative way to create a raised flower arrangement. 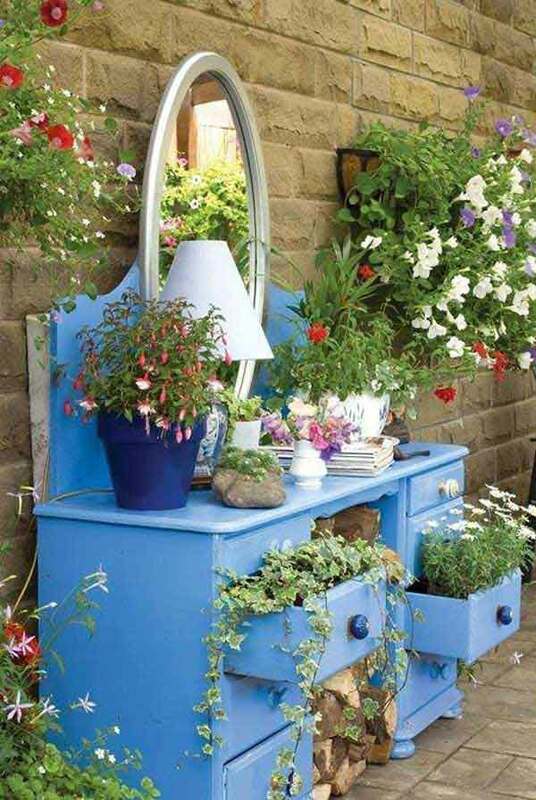 Along with old chairs, dressers and cabinets also make for a handy and useful prop in the garden. They double as both as a flower arrangement piece and also create additional storage that may not otherwise be available. Are you known for your ability and skill as a painter? 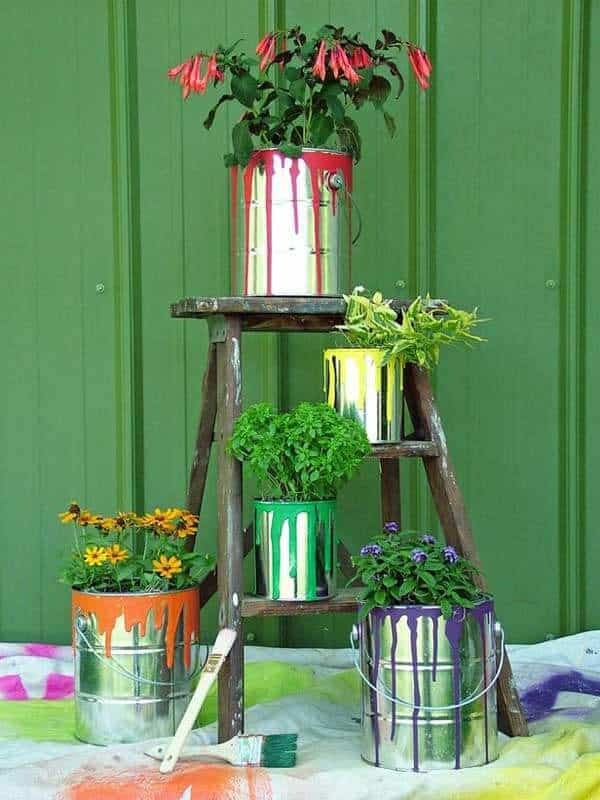 Show off your passion for painting by using an old step ladder and empty paint cans as props that will add identity to your flower garden. 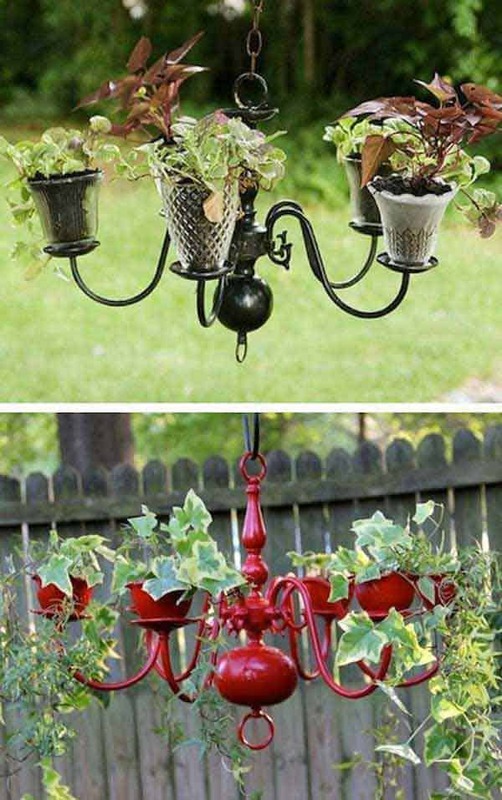 Spoons and other kitchen utensils will create unique hangers throughout your landscaping. With a few simple bends and a screw or two, these show off your love for the kitchen. Almost every man’s garage has a collection of old tool and tackle boxes. These will work great either hanging with a bracket or mount or simply placing them on the ground. 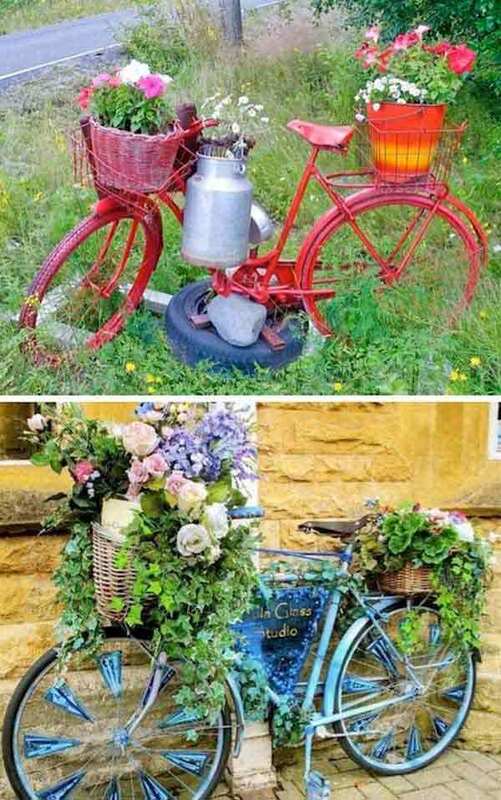 This is another creative way to have a movable flower arrangement that is easy to transport from place to place. 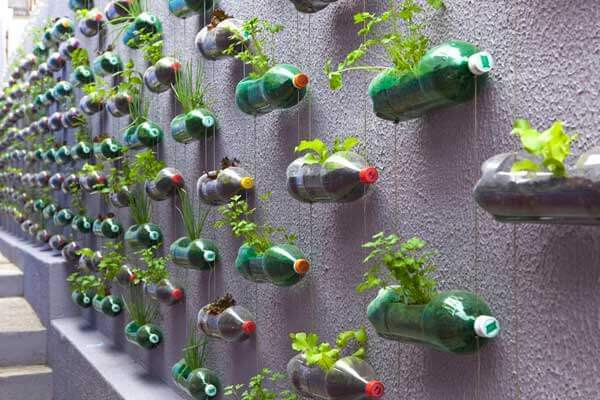 Plastic soda and water bottles make a simple hanging flower pot. They combine easily with any design or outline to add scenery and color to any wall or fence. 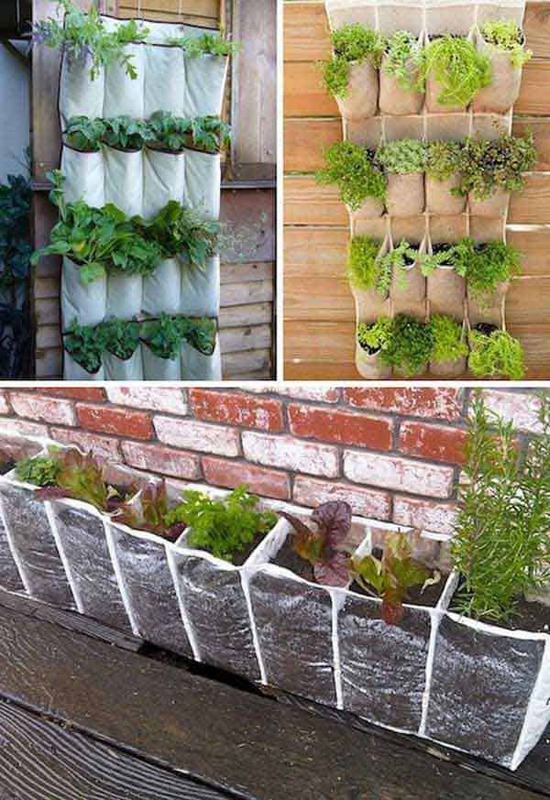 They are also a great value, adding money to your gardening budget and reducing landfill clutter. Hanging light fixtures that no longer work or are not being used transform into a creative hanging flower arrangement. A perfect fix to problems created by limited space, and a great conversation piece! 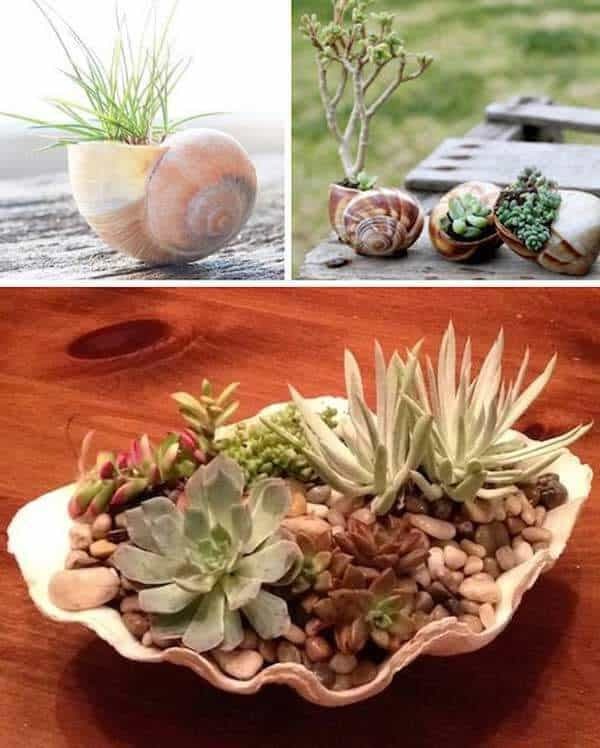 Seashells also add decoration and style to a garden of small plants. This is a great idea for creating attention for a plant or flower that might otherwise go unnoticed. 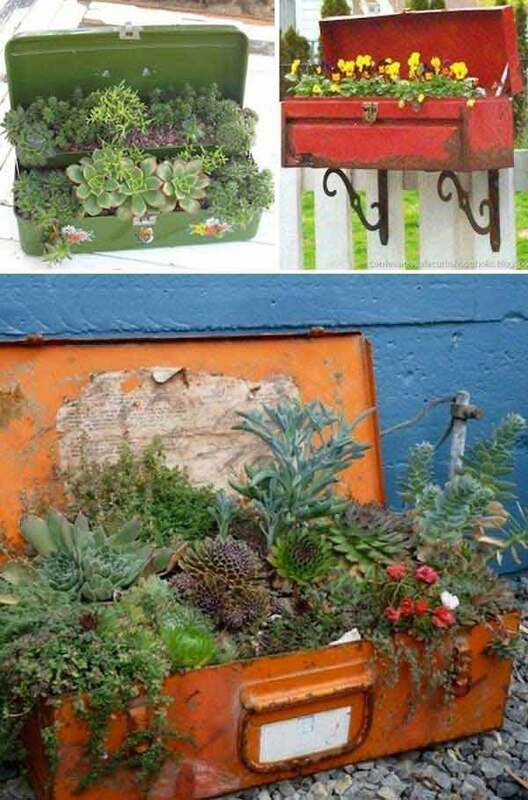 Whether you live near the beach or not, this is a great way of giving your garden its own personality. 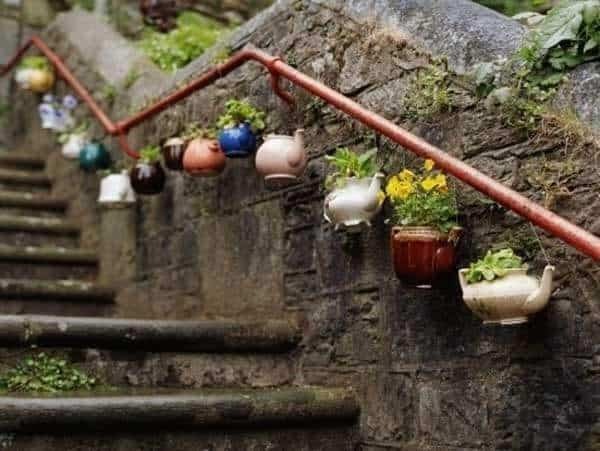 A teapot or kettle collection is a great way to arrange a hanging garden. They will add identity and individuality to any landscaping atmosphere. They are both easy to hang and arrange in the theme you are trying to create. 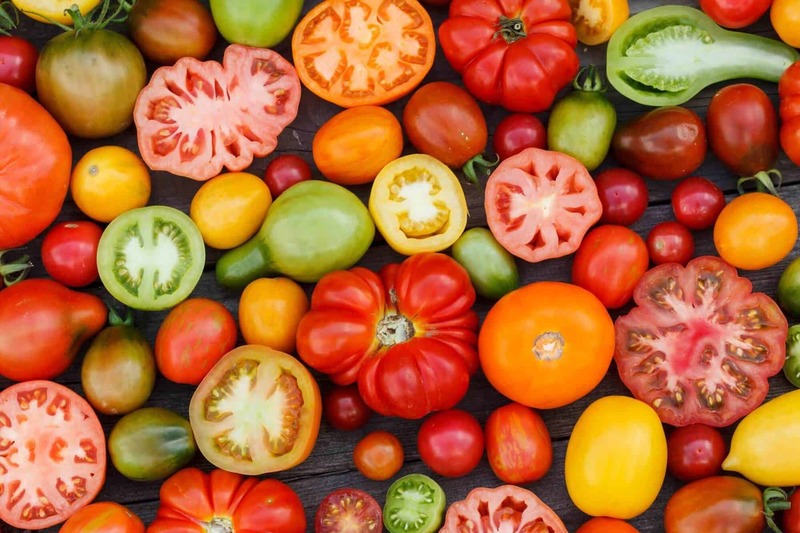 For a lot more great gardening tips, see our guide on 31 Ways to Make You an Organic Gardening Guru. Author and retired entrepreneur Joseph Biggs writes for Organic Daily Post exclusively, when he is not spending time outdoors with his family. He, his wife, and their children and grandchildren live on an extended mini-farm where they all practice conservationism and a whole-Earth approach to life. How Much Apple Cider Vinegar Should I Drink? Copyright 2019 by Organic Daily Post. All Rights Reserved. Articles and information on this website may not be copied, reprinted, or redistributed without expressed written permission. All information on this website is strictly for informational purposes only and should not be taken as medical advice. The statements made on this website have not been evaluated by the FDA (U.S. Food & Drug Administration). The products linked to and sold on this website and any information published on this site are not intended to diagnose, treat, cure, or prevent any disease. The information provided by this website and/or this company is not a substitute for a consultation with your physician, and should not be construed as medical advice. The links on any page of this site may contain affiliate links for which we are compensated.